The earliest concentration camps forced their prisoners to undertake pointless physical activity like stone breaking, but as the camp system developed the Nazis increasingly exploited prisoners’ labour for economic gain. After the outbreak of war, the regime set up camps which used slave labour to produce materials for the war effort such as quarrying and armament manufacture. Auschwitz III, a significant part of the Auschwitz complex of camps, was a labour camp which supplied slave workers to factories attempting to produce synthetic rubber, synthetic oil and armaments. 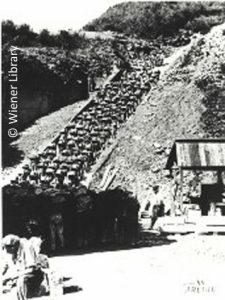 Prisoners were used to construct camps, factories, and to dig tunnel complexes such as at Mittelbau-Dora where weapons factories were relocated to avoid bombing. They were forced to live underground in unstable tunnels, deprived of light and fresh air. Life expectancy was shorter here than in most other concentration camps. The physically demanding work, starvation rations, and inadequate clothing meant that life expectancy for prisoners in most labour camps was a maximum of six months.